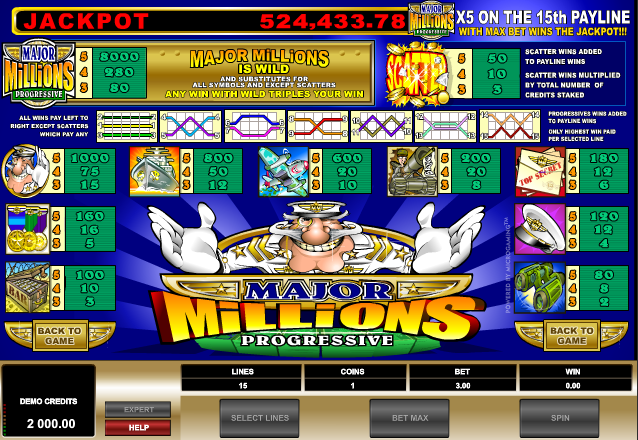 A useful measure of the popularity of any progressive online slot is to check out the size of the jackpot; this is especially true for older machines which usually see their jackpots decreasing as the user base dwindles. Major Millions has bucked the trend here and remained popular despite it’s age. The major himself is a wealthy chap who looks as though he doesn’t really still need to be working at his age but he obviously enjoys his role in the military. 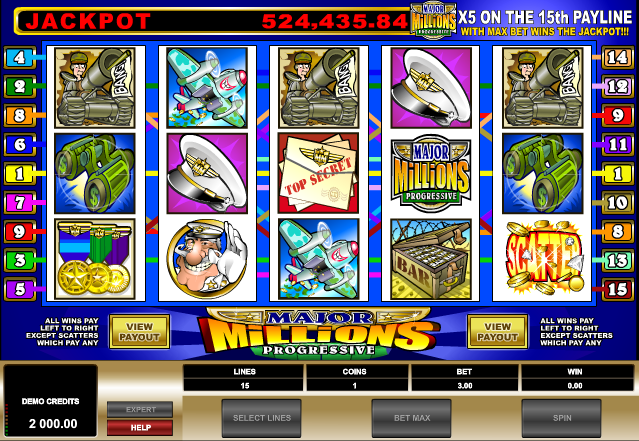 Major Millions is a Microgaming release with five reels and fifteen paylines; it has a distinctly military theme and so all the symbols are related to that theme. They include a pair of binoculars, a box of ammunition, a the major’s cap, some medals, some secret documents, a tank, a fighter plane, a warship and the major himself. The special symbols here include the Major Millions logo which represents the wild and a big explosion which is the scatter. The wild will substitute for everything except the scatter and any win to which it contributes will have it’s value multiplied by three. As one of Microgaming’s older slots, there is no separate bonus game here but what does that matter when there’s a progressive jackpot on offer. The key to the jackpot is the wild symbol and to win the big bucks you will need to land five of them on payline fifteen – that’s the one which begins with the symbol in the bottom left hand corner and zig zags across to finish in the lower right hand corner. The current jackpot total is shown above the reels. The jackpot can only be one on the fifteenth payline which means that you will have to have all lines active to be in with a chance of the big win. This is an old’n but a good’n and though it clearly looks dated now it’s fast moving and good fun. Playing it will also keep you wondering what you’d do with all that money.